Reason No. 342 why I brag to my out-of-state relatives about our fair Chester County: the many opportunities for youth. I've often written about the Police Athletic Leagues and its programs that foster positive relationships between young people and local law enforcement communities, but those aren't the only programs to encourage such positive connections. I just recently found out about a free summer camp sponsored by Pennsylvania State Police for Chester County boys and girls ages 11 to 13. A couple weeks ago I met State Trooper Corey Monthei at a child car seat check in Phoenixville. Corey and other volunteers from Chester County's Safe Kids program were checking that car seats were properly installed, and I was manning an information table. It was then that he told me about the Chester County Camp Cadet program. I'd heard about the program before but didn't know details. This weeklong, overnight summer camp program introduces young people to law enforcement and allows them to interact daily with the troopers who donate time as camp counselors. Modeled after the Pennsylvania State Police Academy, the camp focuses on fun, but it has a strong emphasis on developing self-confidence, self-discipline and respect for others. This past summer, 63 boys and 43 girls attended the camp in East Vincent. "We have a lot of fun showing the kids all the different things police officers do," Corey told me. This summer they had many guests provide demonstrations, including a SCUBA dive team, a fire company, a K-9 trooper, horseback troopers, a helicopter crew and even a bomb squad that delighted the campers when they blew up a watermelon. The campers also take hikes, play games and have lots of hands-on experiences. Local youth apply to attend the camp, Corey told me, and are taken on a first-come, first-serve basis. This past year 180 youth applied. 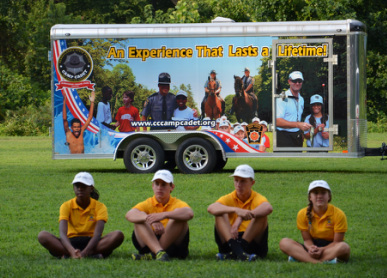 "One of the misconceptions about Camp Cadet is that it's for low-income youth," Corey said. But in actuality, there is no income limit for families; all youth are welcome to apply. To make sure that as many youth as possible can take advantage of the opportunity, campers are only allowed one year in the program, with one exception. "Each year we pick two outstanding cadets to return the following year as a (junior) counselor," Corey explained.